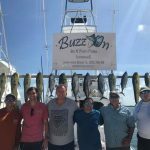 The Islamorada September fishing report comes as our summer season winds down. The dolphin fishing has been great over the summer and they are still around. We are findind plenty of blackfin tuna on the humps so far in September. 9-17 perfect weather today and flat calm seas. 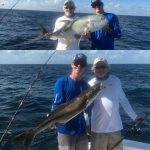 We found the dolphin again today and then got into the blackfin tuna on live baits. 9-21. the dolphin are still here and we got them, Threw in a few blackfin tuna too. 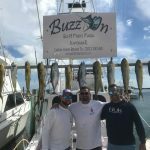 The “Buzz On” is a Islamorada Fishing Boat 46′ Whiticar built in 1974. She has been properly maintained over the years; a beautiful boat and one of the most seaworthy boats out there! Repowered several years ago with twin 490 Cummings, cruise 26 knots, Air Conditioning, inside head, and a new salon inside.